Yesterday was Ostara, the spring equinox, the first day of spring. And I dyed eggs with my kids! 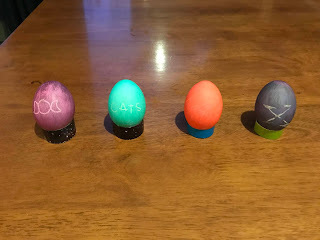 (We do it on Ostara in our house instead of Easter, since we don't celebrate the latter.). Anyway, one of the more fun things about coloring eggs is mixing the colors. Dipping an egg in one color to then follow it up by another color and then see what comes out of it. Of course, you need to be careful what order you do this in, plus some colors just don't mix. Hubbie and I got some pretty nifty resulting colors from that practice this year. See, one of the things we do every year when dying eggs is make Wish Eggs. We blow out the insides of an egg for each of us. Then as we decorate the egg, we think of a wish for the year ahead and share it with each other. We keep these eggs on a shelf in our dining room so we can remember our wishes, until next Ostara. This year Youngest wished that a chick would hatch out of her egg (remember these are emptied out). We all laughed, but she plans to check on her egg every day to see if a chicken comes out of it - lol. My wish this year is for more balance in my life, with a side of inner peace - that inner peace goes hand-in-hand with the balance, of course. I just want to feel like I'm paying the proper amount of attention to each thing in my life. Yes, I'm talking about that long list from my Balance post. What, you thought I was off the whole time theme? Nope, still going. Time to chase down that Balance Unicorn, with a pitchfork if I have to. Now that spring has sprung, what's your wish for the year?